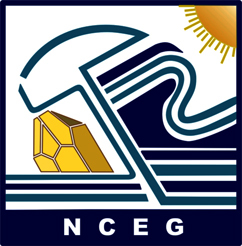 The National Centre of Excellence in Geology (NCEG), University of Peshawar (UoP), is an institution of higher learning and research in geosciences. It was established in 1974 under an act of the parliament. Dr. R.A. Khan Tahirkheli was the founder Director of the Centre. Upon his retirement, Dr. M. Qasim Jan succeeded him in 1988 who was succeeded by Prof. Dr. Syed Hamidullah in January 2001, Dr. M. Asif Khan in 2002 and again by Dr. Syed Hamidullah in 2003. After, the death of S. Hamidullah, in an air crash, Dr. M. Asif Khan became the Director of the Center. Upon the appointment of Prof. Dr . M. Asif Khan, as VC KIU, and then retirement, Prof. Dr. M. Tahir Shah took the charge of Director, since November,2013. It should be a matter of satisfaction to all concerned that the Centre has been successful in the pursuit of the aims and objectives for which it was established. It has a highly qualified staff with advanced degrees from France, Pakistan, UK and USA. The staff and students have been enthusiastic participants and contributors to national and international conferences, symposia, seminars, and workshops. Several of the faculty members have availed prestigious fellowships, and delivered invited talks in many institutions of Asia, Australia, Europe and America. Three of Centre’s scientists have been awarded Civil Awards (Sitara-i-Imtiaz 2, Tamgha-i-Imtiaz 2) Presidential Awards (Izaz-i-Fazeelat 3), Commonwealth Fellowship (2), Fulbright Fellowships (7), Pakistan Academy of Sciences Gold Medals (3), Pakistan Book Council Earth Scientists of the Year Awards (4), as well as Star Laureate and IUCN Environmental awards. Professor R.A.K. Tahirkheli was elected Life-Time Honorary Fellow of the Geological Society, America (1985), while Professor M. Asif Khan was elected Life-Time Honorary Fellow of the Geological Society, London (2008).